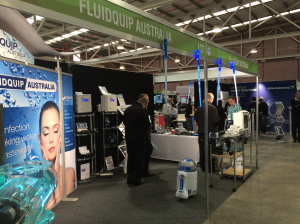 Home » Latest News » Travels with David – Down Under, the WIOA Tradeshow Holiday Snaps and R2D2! 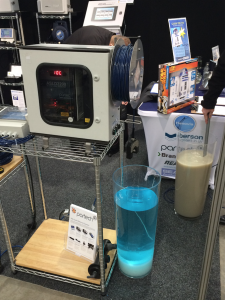 As you may know, our very own David Wilson went to Australia for the WIOA tradeshow… But he had some other exciting water based adventures too! David arrived in Australia on 25th August and spent a week visiting customers in Sydney and conducting technical training with one of Partech’s down-under distributors, Fluidquip. 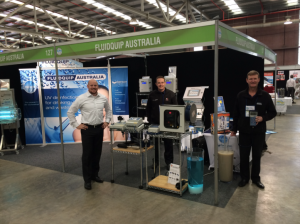 We recently held an interview with Fluidquip, which you can read, here. The second week of David’s trip was spent visiting various water companies and consultancies in the area and taking in some of that Aussie sunshine—it’s all right for some eh David? In the middle of the second week the WIOA tradeshow took place and David and the Fluidquip team held a competition to win an R2D2. All attendees had to do was guess the concentration of Fuller’s earth suspended solids. The concentration was between 5,000 and 10,000 mg/l and at the end of the second day, they tested it with the portable 740 TSS meter. David had to say goodbye to R2 when the winner was announced, which is a shame as we’d have liked him to have some company on the 38-hour plane trip home! 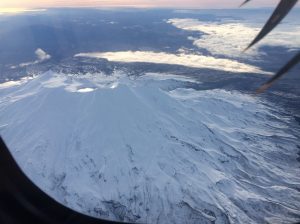 Then David headed off to New Zealand and spent a day on technical distributor training with Instrumatics New Zealand, who we’ll be speaking with later on this month! David then spent two days visiting customers around Auckland and Wellington before he took his long trip (without R2D2), home. We’re glad to have you back David! Here’s some of his best holiday snaps!